Looking for a quick pasta recipe the whole family will love? Try my Easy and Delicious Weeknight Taco Pasta recipe that features creamy taco pasta with beef, cheese, and taco seasoning. As a busy mom, I love making meals during the week that are delicious, flavorful, and most of all easy to make. This Easy Weeknight Taco Pasta is one of our family’s favorite and most requested pasta dishes. This easy taco pasta recipe combines the wholesomeness of pasta with the delicious flavors of cheesy, beef tacos and will be enjoyed by even the pickiest eaters out there. This taco pasta is made with light cream cheese and makes for a healthy balanced meal when paired with a salad and corn. Even better, you can have this creamy taco pasta on your table in 30 minutes or less, making it the perfect meal for busy weeknights. Begin boiling pasta according to package instructions. Cut ½ block of cream cheese into small squares and add into ground beef mixture. Begin stirring in cream cheese and increase heat to medium/high until all cheese has been incorporated and sauce is creamy. Remove ground beef from heat; Drain pasta; Place hot pasta into casserole dish and stir in ½ cup of cheese. Add in taco mixture and mix well. Top pasta with remaining ½ cup of cheese and bake uncovered at 350 degrees for 15 minutes, or until cheese is perfectly melted. Pair it with a delicious salad and enjoy this easy and delicious weeknight meal! 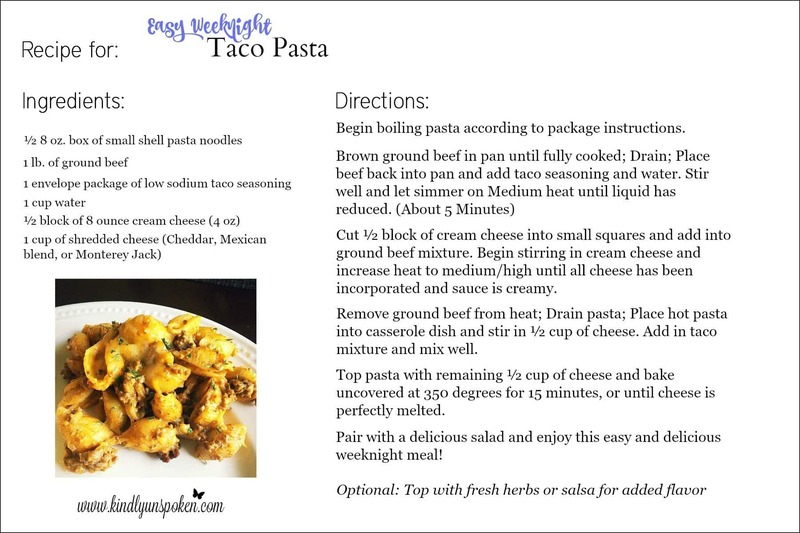 Get your printable recipe card below for my cheesy and delicious weeknight taco pasta! Hope you enjoyed today’s Easy and Delicious Weeknight Taco Pasta Recipe and I hope you’ll give it a try this week! Would your family love this taco pasta recipe? Let me know in the comments! Before you head out, don’t forget to check out some of my other amazing dinner recipes over here! Oh my gosh Cara. Now you have me craving Mexican!!! Yummmy! I love all things PASTA! I can’t get enough of the stuff. it’s amazing really, that I don’t weigh 900 lbs! What an easy and fun looking dish! Haha, my husband is the same way and could eat pasta every day. Thank-you! Oh, that looks yummy. I love easy meals like this. YUMMY!! Looks so good, hearty and easy! Definitely going in the meal rotation! Have a wonderful day gorgeous!! This would definitely make my husband happy! It perfectly easy and crowd-pleasing. Thanks for sharing! This looks amazing! Can’t wait to try it ? Oh this sounds so delish!! I love how easy it is to make and so kid friendly! This looks delicious and so easy. My boys love tacos and pasta, so I’m sure they’ll love this!! They would love this then, Emily! Thank-you! I am a sucker for anything with pasta shells!!! Yum! Looks delicious and I think my husband would love it. You had me at taco, and then added pasta… Two of my favorite things! Gaaaaah so yum!! I have made something similar to this before and my husband LOVED it. Must try your recipe! Awesome! There wasn’t hardly any leftovers once my husband got ahold of it-haha. Oh Cara you have combined two of our favorites, pasta and taco. Way to go! This looks so yummy! I never would have thought about having tacos in pasta form but now I need to try it. It’s delicious, Kate! Enjoy if you try it! So, I’ll now be making that this week, haha! Thanks for sharing. This looks delicious! This looks delicious!!! I have seen so many taco pasta recipes floating around but have never jumped on ones. Yours looks super yummy and I love shells! they are one of my favorite noodles. I may have to give this a go! that looks delicious. Bet my husband and mini-me would go crazy over this! Ooh this looks SO good! I think I’m gonna have to try this one out! this looks so amazing. adding this of my list of recipes to put into rotation around here! So quick and easy I’ll definitely be making this soon! Things taco so I will be giving this a try! Yum! Great for a weeknight! I love taco pasta. I also love mexican stuffed shells, similar to this but with salsa. I should make one or the other soon. Thanks! Mexican stuffed shells are one of my favorites too, but it’s a bit more time consuming so I try to make it on the weekends, but definitely just as delicious! I love anything that is a take on Mexican Food!! This is a keeper! Yum! Oooooh! This sounds delicious! I’m pinning this to make later in the week! Thanks! That looks so delicious! My entire family would go crazy for it and I love that it is easy to make on a busy week night. Looks easy and yummy! I’ve never had anything mixing taco and noodle, but I like both so I bet I’d like this! This looks delicious! And simple, too! Yum looks great, love the little recipe card you made! We usually don’t have a lot of leftovers-haha. Thank-you! I do too, Kusum! Thank-you! Yum. Yum. Yum. I love this! Any Mexican food is totally up my alley. Thank you for sharing! I’m happy to have found your blog! So happy to have you here, Molly! 🙂 This recipe is delicious! What a great simple weeknight dinner idea! I just sent this to my husband. It looks sooooo good. We have everything for this except for the cream cheese! Yum! Looks like something my whole family would love. Pinning! looks yummy!! and nice mix up from regular pasta! Saw this on the Wonderful Wednesdays linky, it looks absolutely gorgeous! It’s my first time joining the linky so it’s awesome to see such amazing recipes up there! I don’t know how I missed this the other day, but this looks so delicious! Definitely trying it! Oh! This looks like the perfect quick weeknight dinner! Pinned for later- can’t wait to try it! 🙂 thank you! Yummm! This looks so good and so easy, too! Will definitely be giving this one a try! This looks like something my hubby would like! Would love to have you share it on the What’s for Dinner linky. Looks very tasty Cara – thank you for sharing with Pin Worthy Wednesday! Looks delicious. I’m going to give this a try tonight.